Well it has been a day of upsets but none look bigger than what is looking like a sure upset with Ohio up 71 to 57 over Georgetown with 10 minutes to go in the second half. It is official as Ohio pulls the shocker and Ohio pulls the mega upset 97 to 83 over Georgetown. This busts up our bracket pretty good and likely a lot of other peoples. We just didn't see this going, we didn't even really even consider Ohio for the upset even though we picked another 14 seed Oakland for the win so it isn't like we weren't on the look out for big upsets like this. Junior guard Armon Bassett went off for 32 points and has backcourt teammate freshman D.J. Cooper scored 23 points so Georgetown really had trouble with the guards. The Hoyas had the height advantage and got more boards but they also had 18 turnovers to 11 plus 36.4% from three compared to 56.5% on a similar number of attempts. 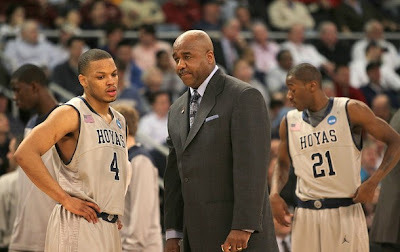 Junior guard Chris Wright had 28 points for Georgetown in the loss but clearly defense was an afterthought in this game.